After all these years, there is finally a 13" filet knife that fits in your tackle box. You won't ever have to leave this beauty at home. 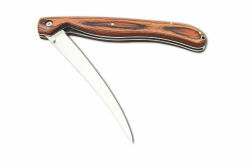 The 5 7/8" 440 stainless steel blade folds neatly into a striking Pakkawood handle with an extra-strong secure liner lock. With just the right blade flex, this is a versatile filet knife that fits neatly into a hard-molded nylon SARGE case with snap closure. The best fish fillet starts with the best filet knife. Buy the best knife to go along with your perfect catch.